Product Showcase: Echo Park Paper Life is Good & 2 Give-aways!! Ease of use: I really liked that there were a lot of tight patterns to work with. I am a card maker primarily, and tight patterns are a very good thing to work with. -It has a good paper weight to it. All in all I liked this line. It was fun to work with and the patterns were a joy. What do you think? Is this a line that will make your life good? Leave a comment by midnight EST on Tuesday and you will be entered to win one of two Echo Park Paper prize packs! I love the new Echo Park paper...Summertime was bright and colorful-but reminded a smidge of another line! " Life is good" line has some softer colors and adorable patterns -- and I also wish it had some cute buttons, or chipboard embellies to go with it! Would love to win this! THANKS! Love the colors and patterns of what I've seen so far. While I'm sure more embellies would be nice, I rarely if ever am able to purchase an entire collection of products, so this might be a nice fit and not leave me wishing for all the other stuff to go with a line. Thank sfor the great review! I really like the colors. I will have to a make a point to look for it at my local lss. Oh I love this company! I have Sweet Summertime and just love it! Thanks for the giveaway! I have noticed a lot of buzz about Echo Park over the last few months. Pretty papers and pretty designs - you certainly did them justice with the lovely cards and layout you made! Sometimes I look at certain papers and just draw a blank as far as what I would do with them - thanks for the inspiration! I love the colors and designs!! Love your Hello card and LO the best!!! Thanks so much for a chance to win some of this fantastic collection!!! love the colors! It will make life good! lol! I love Echo Park. Their colors and especially their patterns are right up my alley! I really like Echo Park-I bought Sweet Summertime as well as some of Walk in the Park. This one's colours don't appeal to me quite as much as the other two (I don't use much pink) but I really like their patterns. Lots of small dots, stripes and other patterns that are very versatile. I love everything about this line - it's just a great versatile line that can be used in many different ways! I have been drooling over these papers from al of the CHA hype. lol. I love everything from the colors to the super cute patterns. Having a hard time finding it, though, even online. Or the shipping to Canada is atrocious. So, that said, please pick me....I'd love to win! wink. wink. I agree with wanting more embellies, but I figure they're a new company and need some time before they can come out with more things. Looking forward to when they do! Also love the smaller patterns ... too many companies have lots of big patterns, which I just don't know what to do with. I had gotten a few pieces of their first release earlier this spring and just love their papers! I was so excited to see the two lines released for this CHA and can't wait to get my hand on some. I do like the line, although my favorite of Echo Park's is still their A Walk in the Park line because of its range of colors. I know Echo Park has a Halloween line out now...I'm looking forward to seeing what else they have in store. It's great to see a new company doing well. Maybe they'll come out with some other products besides paper and stickers too. I too love the bright colors in this set. I have yet to try this company, but I like what I see! I love the look of Echo Park. I haven't seen it in person yet, but look forward to trying it. WOW this new company has some incredible papers that would look AWESOME on any project!! I have the summertime collection. This one looks great too! I really like the colors and would make embellishments to match using markers or such. Adorable examples! I like this new line-I can especially see using it for layouts about my students or my nieces. Love the colors and can't wait for this line to hit the shops. I really like the colors and small patterns. I really like their smaller patterns - definitely makes their papers easy to use! I have worked with the summertime line and loved it. This is one of my must have's! Love the line. The colors are so girly and just beautiful. Thanks for the chance to win. I am really liking the patterns that Echo Park is putting out there. This is a great line! 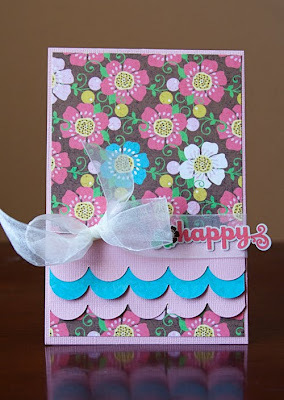 I'm a cardmaker too, and I just love these patterns. The colors are beautiful and looks like a must have for me! I definetely need to have this line; I just got the Walk in the Park papers and the colors and patterns are awesome! I even think I'm gonna like this line better! I've hearing loads of good things about their paper lines. I'm really excited to try it out as their kits are lovely! Love Echo Park!!!! I have their 1st 2 lines and they are fabulous to work with!!!! I want this one you showcased soooooo bad. Love the colors! I like what I've seen of their papers, but haven't gotten to look at it in person yet. i LOVE echo park!! i cant wait to get my hands on their halloween line!!! Echo Park papers are so cute. I hope I have the chance to work with them someday. I've been hearing the buzz even up in northern Canada here. I like what I see so far! Even as primarily a scrap booker I appreciate nice tight patterns. I really like the colors of this line too! Lovely patterns and colors. This certainly is a great collection. i just completed my first echo park layout with sweet summertime and loved the cheeriness! My fave was the alphas and borders! THey added so much to the cheery papers! I cannot wait to get the Good Life into my collection.... love, love, love the colors! I like the variety of colors in this line. This is my first time to hear about this company--thanks for the giveaway! every time i see something by echo park, i am more impressed than the last time! I like what i have seen so far, cant wait to try some of their papers and see what else they have in store for us. I love Echo Park - all of the lines! great new company! I love the beautiful bright colors of Echo parks papers!!! I really love the bright colors, but embellishments would have been a good addtion to have. I've heard so many good things about this company; I'd love to try their papers. definately a good thing! lovely line of paper! I LOVE this paper. Seeing it used in cards and L/O's makes me want it more. It's very versatile and I can picture many ways to use it. Hope they come out with some embellishments to match. I love all of the Echo Park lines! 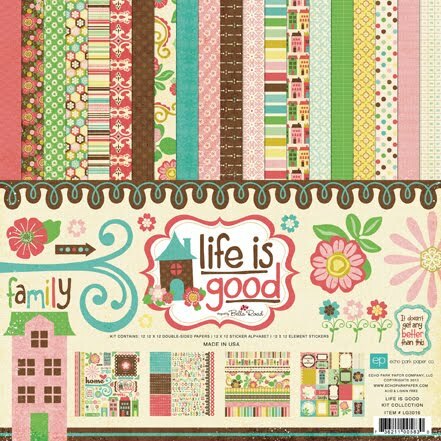 I especially love the color palette and patterns in the Life is Good pack. 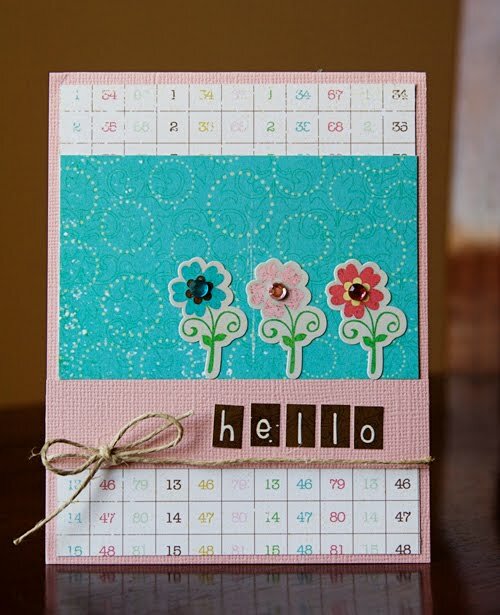 I can see using this whimsy paper for summer and spring layouts. Sweet! I would love to have real embellishment like you too, but you cards look good to me. Very playful and looks like it could've been released under the "Cosmo Cricket" banner and that says a lot. Thanks for sharing! Oh, I absolutely adore Echo Park paper! It does have a nice weight to it and LOVE the patterns and colors. love this paper! the colors are awesome - so bright and pretty!! I could use this to scrap some of my pictures from this spring/summer of my granddaughters. I am hearing so much buzz about this Echo Park paper. It looks like it would be so much fun to work with and I love your honest review. I wouldn't have thought about embellishments until I started scrapping with it, but it wouldn't keep me from using this pretty stuff! I bought Echo Parks 1st line (Summertime) and love it!!! I think its great that they come out with a new line each month. I also like the fact that they don't have all the extra stuff, I can get the paper pack and it has everything I need. I have enough of the 'other stuff' in my collection that I can use up. I am anxious to add all of Echo Parks collections to my collection soon! I love the look of this paper company... nice rich colours and I cant wait to have a play with it! I really like this paper, love the colors. Can't wait to see it in person. I can't wait to play with this line. The patterns and colors are great! These EP papers look very interesting, I think I would really like use them! This is my new favorite company...I just love all their papers...unfortunately I can't find it here yet as my lss don't sell it. I got sweet summertime off of cropchocolate.com but that is it. I agree they need some embellies but the papers are super fun to work with at least. Nedd to try to tell more- so need to win! !